T he Schoharie Valley Concert Band is celebrating its 39th season of providing quality musical performances to the residents of the Schoharie-Cobleskill communities and its surroundings. This band was founded by Frank Meredith in 1979, and has always been an eclectic mix of musicians from high school to octogenarians, people from all walks of life, coming together to create music. Long tenured Schoharie High School Band Director Don Menz was a strong supporter of the band and many of his students continue as members to this day. In 1987, the baton was passed to Donald Webster, who continued the tradition of fine leadership and providing the students and adults of the community with the chance to realize their dreams of creating music as a part of everyday life. It was during this period of time that the Solo Festival was begun, providing scholarships for Middle & High School music students and a performance by the senior winner with the band. 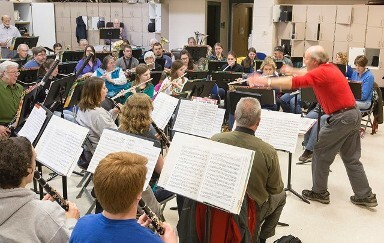 After Donald Webster's retirement as conductor, the band honored his efforts by naming the solo festival in his name. Martin Zavadil, the band's current conductor, continues to challenge the 60 member ensemble as they seek to refine and expand their music performances. The band's current schedule includes four concert series, each concert being performed twice in the communities of Schoharie and Cobleskill-Richmondville. Each concert features one or more guest soloists including musical colleagues from New York City. Past performances include a concert at Lincoln Center on the famous Damrosch Band Shell (home of the Goldman Bowl), the Northeast Music Festival, Burlington Vermont and NYSSMA. At its spring 2009 concert, the band played the premier performance of "Schoharie Triptych". A piece composed by Nicholas Ascioli commissioned by the band to commemorate its 30th anniversary.